During our ascension journey, I have written about my role as a stabilizer many times but I was never told/guided to write in-depth about this and how it is to act/be a stabilizer, within this transitional phase, especially during the Eclipse seasons, for it is then when we are most active, harmonizing the Higher Frequencies - that first gatekeepers anchor on Earth - and that takes approximately 6-10 months to stabilize. Stabilizing after receiving these potent energies, is essential, for it is like the frequency we receive from our Central Sun. When the sun shines brighter, it is not doing so to harm us, as the sun's frequency simply Is. The sun - like these energies - is simply doing what it has to do within Creation, to shine its consciousness. But because of our human nature, these energies could be too much for us and thus we use protection, as well as our Planet and its magnetic field, as these energies are too potent for us, if not properly stabilized. You, as the sun, are all pillars of light. Each one of you brings a different frequency. Some are meant to just shine, others are meant to anchor certain energies from certain portals, others to stabilize them and there are infinite other roles that I am just beginning to discover as I continue to co - create readings and sessions with you all. It is with great love and respect to All soul roles that I share this, in case it can be of assistance to the many souls, that I know are also there acting as stabilizers and New Earth Anchors, or beginning to embody their soul roles, without the proper understanding as once happened to me, which is the main reason why I was told to share, to help those who are in darkness as I was once. I do thank all the infinite soul roles within Creation, but I can only speak of what I experience myself. So this will be focused on what I do and the many varieties within this role. There are different ways of stabilizing as well as working with the New Earth's 5D Grid. As you are unique, you will have your own way of assisting. Take only what resonates - or will help you in your journey - and follow only your Unified/Soul's guidance. The symbols provided in this article are meant to be used for all stabilizers, there are others that are only meant to be used for me, as you all will have your own - these will not help you in your area - this is why I was not guided to share them. As for the rest, feel free to use them, if guided. Many of the tasks involving stabilizing are done by our Unified Self - through us - in unconscious ways and mainly using our soul's unique essence to do so. There are also many ways in which you could be helping to stabilize the energies coming from the cosmos, at this time, as well as creating the harmony required within New Earth Timelines for these New Energies to be anchored. Remember that an evolved aspect of us is already dwelling in a 5D timeline. When we stabilize, in the higher astral, usually it is done during our sleep phase, we, or at least I, see a light web where we only envision those, that like us, possess the same soul role that we do. We, are at all times connected through this light web, acting as One - no matter from where we are from or if we know each other - or not - in our physical daily lives. What matters is to unite our forces to be able to function as harmonious conduits of love that will be able to bring balance into the energies we are facing. Another question I am often asked, is about the frequency in which we change locations and what I do - exactly - to stabilize. Well, to the first question, as stabilizers we are placed differently than - for example - gatekeepers where most of the time they spend a certain amount of time in a place and then they are called to go to another place. In our case, we are placed in a single place during almost all of our lifetime, for it is where our frequency should act and help anchor this balance. This can change, there are many factors involved, for example, if new stabilizers are born in the same areas, as there are not many, especially if the place is small, or at least this is what I was told, and then we will be relocated but essentially we will move ourselves between a range frequency that involved near cities instead of moving from one country to another where there are already other stabilizers with a specific frequency for doing this work in their area. This is something I would like to share for there are many of us who are frustrated at the beginning when we realize that no matter where we try to go (escape when we do not understand our role) the Universe will always put us where we belong in frequency. There are also some places on Earth that need no stabilization, higher places who are already activated by nature. We have in Spain for example, Montserrat, in Barcelona, as I was told, where there are intraterrestrial beings holding a 5D frequency, as well as other places where stabilization is not possible, as in the extreme case of Antarctica, for example, for the frequency there simply disallows it due to war experiments and other factors. Other places such as Syria, are at the moment holding a lower frequency, but on the contrary to what one may think, there are five - at least that I know of - stabilizers there, doing this work. Remember that New Earth is already birthed, there will be other places from this 3D Earth where these Higher Energies could not be, at the moment, anchored, this is where the rest of the souls who need to keep reincarnating will be born again and 3D Earth on a parallel timeline will continue to exist and to evolve, or not, at its own pace. It is not easy to explain how we maneuver with the different light lines and energies in the astral plane for neither the colors nor the sensations - one feels - can be ever described. For as humans, we do not have these same colors, experiences and ways to act within our physical realm. So I will focus on what I do to help stabilize - when I am in my awake phase - which is easier to explain. When we awake to our soul mission, or an aspect of it, for even if our soul mission is only one, the more we grow and integrate higher levels of consciousness, the more we will keep embodying new aspects of it. We do this without knowing, without even realizing what we are doing, and until we are able to clear, heal and unify ourselves, and begin the inner work of soul integration, we are not in a position to be able to commune with our Unified Self to regain a broader perspective of what we are truly exercising, in the physical. If you are beginning to awake to your soul role, pay attention to every revelation, sensation, from where it comes in your body, signs, numbers and the many whispers that your soul, when you pay attention, sends to you. In my personal experience, I am a number 4, which represents strong foundations, required to build something enduring in time and space, stability and balance. I have always felt great intensity in my heart and my legs when new waves come, for these are the main physical sensations that will help you know that you are a stabilizer, as these body parts rule your balance and how you sustain your own self, in the physical. Numbers do not just possess the human meaning we give to them, as happens with names, numbers are made of vibration, of sound. In the Higher Realms, numbers are seen as light patterns, codes and different essences. In this case, we work with different numbers, as it is number four, because it not only implies balance but Love - that shall be brought to All - as well as the strong pillars that we have to become - and anchored for All to be able to transit into New Earth as well as for the energies that have been anchored by gatekeepers and others - remaining balanced. Until I became fully aware of my soul role, I noticed how I lost balance simply by being in a crowd of people, negative energies, dramas, and also during the Eclipse seasons, and special cosmic events that trigger what we are, for this is the way the Universe has to show us what we came here to be and do. There are also many ways in which this Planet, which is One with you, although an independent organism, has of telling you in which ways you can assist Her. 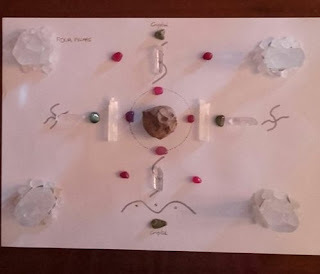 Do you feel the need to make crystal grids, with a specific form, when you are in certain places in nature? Although, you can also do this at home by bilocation or simply with the pure intention to do this. Have you been receiving symbols, numbers and all of them related to numbers 4, 6 and 8 and so on?? If you have been following the signs, if you have been told by your Unified Self/Guides/Soul, never others, in the first place, this shall come as a confirmation, you must know it yourself first, you may be one, then you would want to begin by using psychic self defence tools, grounding mechanisms and other light/healing tools to begin balancing yourself before you could step out there as a stabilizer. Using these tools is pivotal, as if we are not first in harmony we will not be allowed by our own soul to act as harmonizing pillars, which on the contrary of what some people, who do not possess this role, speak, is not just remaining in a bubble of love and harmony all the time without doing anything. It involves, self-discipline, working with New Earth Grids and being able to confront long periods of solitude wherever you are guided to go. Working with psychic self-defence, involves building your Antakarana cord, which is not simply a symbol but a protection at all levels. It is a threat we build from our physical body to our soul and that will reach our Monad and Unified Self as we keep practising it. This is essential when we begin to ascend and if we desire to embody our soul mission and be able to communicate with our Higher Selves. It is necessary to consciously build this cord that will set our pure intention to work with the Higher Aspects of who we are, and assist All. For, until we awake and freely choose to ascend and fulfil the mission that we chose on a soul plane, our soul and Unified Self will not intervene within our human experience. Psychic self defence also involves working with cutting cords that drain us, as it is past relationships, situations and beings that are not in our present path any longer and that have also the right to be released so they can enjoy their human experience without being energetically attached to us. One of the first things or that we could also begin to do simultaneously is working with our emotional body to heal/dissolve the debris parasites between many other things that dis-empower us and prevent us from forgiving ourselves and others. Another important thing is the release of old contracts, karmic ties and residual karma, for these are the main issues that impede us to begin the endless work of soul integration and descension of new aspects of our soul mission. Next step, is to reclaim your sovereignty as a Divine Being. You should prepare now to ground yourself and connect with Mother Earth at all levels in other to regain insight of what She needs and what you need for assisting Her. This is the first thing to do to anchor yourself to Earth at the same time that you too are anchored to the Higher Realms. It is not just about nurturing your connection to the ethereal but about bringing all this Higher Light, which is consciousness, Divine Wisdom and healing to All into our physical one. It is also important that you listen to your body to know in what ways is better to nurture it at the intense phase in which you spend the majority of your day stabilizing. It is important that you drink lots of water, remember it helps you conduit the light within you as well as to eat food that helps you to be grounded - potatoes, seeds, cereals, nuts etc. To the question about meat, I do not judge your process or how you choose to eat or feel grounded. Personally, I have chosen a diet free of eating other beings, but this is my personal choice and I feel all choices are pretty much respected within Creation, so this is just in my personal experience and what works for me. For me not eating at all until lunch time works, I just drink water mainly and/or smoothies, but this is not what it has to be for you, maybe you prefer to eat much in the morning and not so much in the rest of the day. To the question: how do I stabilize? Im going to share some of the many symbols, and after that one universal grid, of what I use to stabilize and how I do it. I create these symbols with my power hand and a pure intention to serve All, in the ground, as well as to bring harmony. 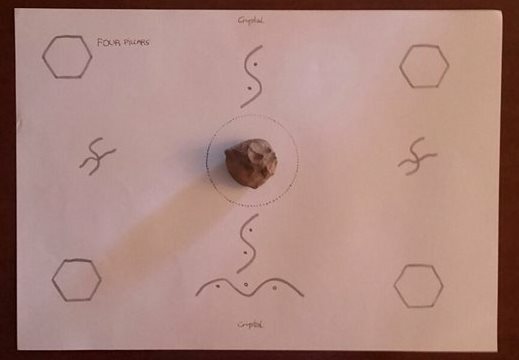 If you are at home you can make it wherever you feel guided and/or even draw them if the surface where you are does not allow your crystals to stand up properly. The symbols I share are the ones who must be made with your power hand, especially if you are in nature. I am only sharing this grid, due to frequencional reasons, as I was told this grid is a Universal one but the rest are specific for me - and the place I live - so it will not work for All. There are others I am not allowed - for Higher Reasons - to share yet. First of all, we clear the area, you are not clearing nature, it does not need cleansing, you are clearing it from the lower energies that may dwell in there by the human hand. I (say your name), call upon my Unified Self, Monad and Guides to assist me in the task of help stabilizing the Planet. I thank you All for your Presence, protection and assistance and it is with great respect to all beings within Creation, that I anchor and spread harmony, balance and stability to All. I ( say again your name) as a sovereign being of my own life experience, am fully conscious of what I am going to do and take full responsibility for it. I choose to only serve the Law of One. I choose to serve All with Truth, integrity and compassion. And it is with profound gratitude that I choose to serve now as a conduit of Love for All. You can also include the elementals and anything you feel free in your own intention. This is the complete grid, but first I am going to decompose it and explan all symbols and crystals. The following is a picture of how the crystal grid - I prepare to stabilize - is made. This is for you to have a scheme of what you should trace in the ground not for you to paint it on a paper. All the symbols, even if later on covered by crystals must be painted in the ground or wherever you are stabilizing first. The first symbol is your soul intention to serve the Universe and your own Planet the best you can as a stabilizer. This word is not just a word, but a light code that, even if our human self does not perceive it, is sent to All as your purest desire to spread balance as well as to call for assistance. This is seen in the Higher Realms. They know who you are, where you are and what you need from them to help you. In the moment this intention is set, the entire Universe is already assisting you in your intention. The second symbol's meaning is a connector symbol bewteen crystals. 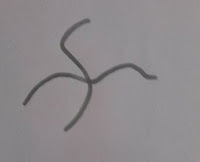 Crystals, already are connected, especially the ones who are programmed to assist you in your specific tasks, they are connected and sending information to each others but as I was told this symbol is also required. The third symbol is the descension and anchoring of these new waves of cosmic energies into the Earth. I literally see it descending in the form of light, this may be just for me, you may have a different way of seeing how balance is anchored. The fourth one means balance Above and Below. It also has to be done by you as you set your intention to anchor balance within and without. 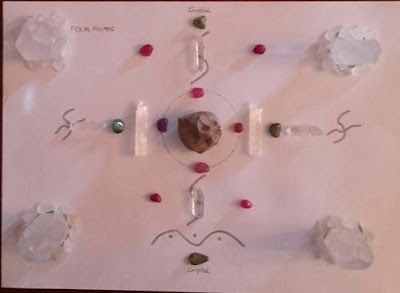 A continuation, Im going to share - again - the entire and finished grid to show how these symbols together with the crystals in the ground. It is ok if at the beginning you use the paper with the scheme. 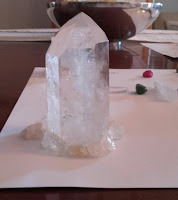 You can also choose to put in the center, instead of an Earth stone of high vibration, a Generator Master Crystal, which will serve to anchor and amplify as well balance. Notice that the quartz points, which are also four, are looking to the center, where we desire to direct the Light - balance - for All. The four pillars of Quartz Master Crystals I use, as I was told to buy these ones, are: a Channeler Crystal - the first one on the top, beginning by the left, a Transmitter - in the second place, the third one is another channeler and the fourth one is a Conductor Master Crystal, which is essential to transmit energy to the other crystal but on the contrary of the second one called: Transmitter, who just spreads the energy to the next crystal - and within the grid - the connector will also connect with other timelines, bringing balance to 3D as well as our present timeline, for our intention is to bring stability to All. The other crystals are white (selenite, topaz) green and pink, chosen by me, I was told the colors, bewteen a variety of green, orange, red and pink, and then I was guided to pick these ones because they work well with Earth and with my own frequency, especially pink agate instead of pink quartz, but you should choose the ones who best resonates with you. I also have chosen Topaz, the little white stones you see around the pillars, because it works better with my frequency that quartz, but again, this is up to you. The stone in the center is very special to me, it belongs to Montserrat, Barcelona. This stone represents the Earth, and I chose it, because I was guided as it comes from sacred soil - and place - and because my Guides also allowed me to do this. Sometimes, there are certain stones we would like to use, as the ones I have from Mount Shasha that are not proper to use to stabilize, in this case in Spain, where I live. This is because even if they belong to a sacred site - they hold a different frequency from the ones in my area of the country. This is what I was told, and the reason I always ask before using the crystals I am going to use. When you finish and receive that balance has been anchored, bless the soil and the area, give thanks to it for assisting you as well as for allowing you to stabilize there. The time is different for all of us. In my case it takes me two days and on other occasions months to anchor balance. When it occurs, set this or another grid as something permanent in your altar if you cannot go into nature, or do it everyday, or bury the crystals and know they are secure - in the soil - for a time. Another important question I am often asked is about the size and beauty of the crystal grid. It is not about the beauty but about the intention, the function of the crystals and the scheme that you are told to create that will be the useful one, that truly matters. This is not about creating a harmonious and beautiful grid for you to work with or enjoy, which is amazing, but about putting things in a certain order, with a precise numbers of shapes - in each crystal - that again make another number and putting them in the exact position to anchor balance. Remember to choose crystals that resonate with your frequency, or that you are told to use by your Unified Self, as I did, especially at the beginning, when we do not really know what we are exactly doing. The essentials are clear quartz crystals, four pillars of quartz crystals, each one of them different, for reasons I already outlined, and others that your own soul will ask you to use. The crystals will act as conduits to equilibrate and anchor balance on Earth as well as within your own being to send to All. Remember that it is through you that balance reaches All, and of course, between many other ways the Universe has to deliver. I will also recommend that apart from all the clear crystals, you choose some that connect to Earth. Remember that you are anchoring balance from Above to Below, so you can use them to visualize the integration of balance within yourself and Mother Earth. There is not a fixed way of doing your soul mission. It is not about what you do but about the intention you put in everything you do, say or think that counts the most. I have been contacted by some people who think they are stabilizers but again they have a family and they have what we may call a "normal" human experience, so they do not believe they are acting as such. Please, do not dwell - within your limited minds - to guide yourselves in how much you do or not. Do not try to do things as others tell you, not even me, like I said, this is just an example of some things I use in case it can assist you. Do not compare yourself with anyone, you are unique, precious and very much appreciated by all you are and do - for All. You are doing always what you came here to do. Honor and respect yourself, you are not just the individualized aspect on Earth called X but God incarnated and acting through you, on this physical Plane. When you wake up, give thanks, always. Source desires that you continue to be alive. It desires to continue living through you, not just to experience a human reality, not to just to learn, fall in love or release/heal your karma, but to remember in what new ways you could be of service, and every day, you have a new gift and opportunity to think in which new ways you could serve. Enjoy a new day of selfless service, enjoy who you are becoming, which is nothing but what you have been forever - a Divine Sovereign Master ~ responsible of all you create and hence experience. Note: I have opened a post on my facebook page, for all who desire to share their unique soul mission for All. This is not to promote oneself but to share who you are and do, in case it can help others to learn in their own journey. Thank you for your contribution and for taking the time to share your page, any links in which you explain more about your soul mission, and/or simply a comment sharing what you do. Thank you for your love, and for sharing with respect.